The Jury awarded the 1st place prize to Schrodinger’s Box, submitted by Emily Yen, 43.47. 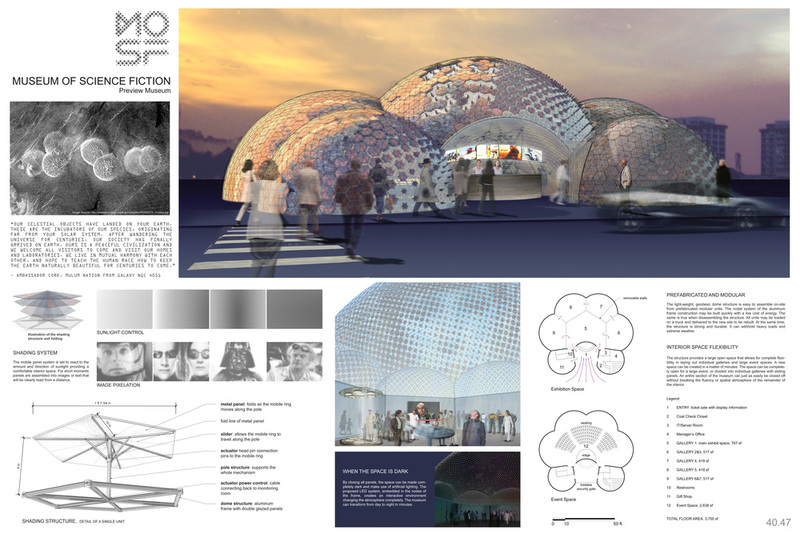 The 2nd place was awarded to 33.29, submitted by Wade Fuh and the 3rd place was awarded to 89.66, submitted by Mikhail Krymov, Alexey Goriainov, and Diana Zhegulina of Arch Group from Russia. 94.29, submitted by Hugh Broughton of the UK, which was the highest ranked international submission – excluding the 1st 2nd and 3rd place winners. 61.14, submitted by Vivek Vijayan Njanappilly and Christian Martinez, from Syracuse University, which was the highest ranked student submission – excluding the 1st 2nd and 3rd place winners. 13.44, submitted by Constantinos Miltiadis of Greece, as the recipient of The Arthur C. Clarke Award, given to the submission that displays the most creative and unorthodox approach to solving the design problem. 40.47, submitted by Jana Janous of the Czech Republic, is the recipient of The Ray Bradbury Award, which is given to the design submission that displays the most unique and original concept related to science fiction. Her submission included a short science fiction story, which was translated into a formal and tectonic strategy for the building. 39.12, submitted by Nirmal Kulkarni from India, is the recipient of The STEAM Award, which recognizes the design submission that best reflects the Museum of Science Fiction’s educational vision, and exemplifies the connection between Science, Technology, Engineering, Mathematics, and the Arts. 98.10, submitted by David Berryman, is the recipient of The Green Design Award, which is given to the design submission that best exemplifies concepts of sustainability and green architecture. 70.38, submitted by Matus Nedecky, Lenka Petrakova, and Stefan Turcovsky of Slovakia, which was selected by Greg Viggiano to receive The Executive Director’s Award. The People's Choice Award goes to 92.86, submitted by Alexander Smaga of Austria and 32.35, from TJ Yap, Chin Yin Huei, and Wong Woon Khai in Malaysia.